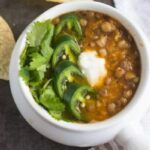 This chipotle lentil soup is a healthy, tasty, easy to make recipe that's both wholesome and protein rich. Shhhh... don't tell your kids! In a heavy bottomed pot, add canola oil followed by chopped onion. In medium flame, cook it until it becomes tender by stirring occasionally. Add garlic, cook it until garlic slightly discolors. Add finely chopped chipotle and adobo sauce. Add tomato puree and continue to stir for another minute. Now add lentil, cubed celery stalks, cubed carrots, salt, and water. Bring the soup to boil, and simmer the flame. Cover and cook it for about 40 mins. Do check and stir in between. Use a wooden ladle to mash the lentils to coarse texture. Add lime juice, chopped fresh parsley. Transfer it to a serving bowl. Top it with a blob of sour cream(optional) and serve. Can be served warm or at room temperature along with tortilla chips or strips.